Gasp! The horror! It’s just a poor, innocent little comma, and so many people abuse it. But I know that none of you want to be part of this terrible trend, so I thought I’d run through some of the worst cases. The dreaded comma splice–This pops up with disturbing frequency. People take two independent clauses (quick review–an independent clause is anything that’s a complete sentence by itself), and link them with a comma. Really don’t do this. Dialogue is no excuse. For example: The dog was big. He had bad breath. This is a perfectly correct, if choppy, way to state these two thoughts. Too much of this, though, and you’ll sound like a first grader. What is not correct is linking the two thoughts with a comma: The dog was big, he had bad breath. This is a comma splice, and it is wrong, wrong, wrong. Don’t do it. This is, “Bad writer, no sale,” territory. An eighteen-year-old, is just not an adult, no matter what the law says. That first comma is a dread abomination. However, if you had written: An eighteen-year-old, armed with a driver’s license and a high school diploma, is just not an adult–this would be fine. Since the phrase ‘armed with a driver’s license and a high school diploma’ is nonessential, meaning it can be taken out of the sentence and it still makes sense, it should be set off with commas. A man armed with a gun, is usually not a happy sight. This comma separates the subject of the sentence from the verb. Really don’t do this. 3. Don’t put a comma between two verbs or verb phrases in the predicate (https://owl.english.purdue.edu/owl/owlprint/607/). Quick grammar review: The subject is doing the acting in the sentence. The predicate is everything else. Putting a comma between two verb phrases in a predicate is fairly common–I’ve done it myself. But try not to. We’re wordsmiths. It’s our job to get the words right. It’s what writers do. She went to sleep, and got up in the morning. The comma is unneeded here. If you really want a comma, you have to add a subject to the second phrase: She went to sleep, and she got up in the morning. In this case, it sounds awkward. It should be: She went to sleep and got up in the morning. He killed her, and stashed the body in the woods. Again, either add he to the second phrase (and he stashed the body in the woods), or you need to live without the comma. Note that this does NOT hold true when there are three verb phrases. At this point you have a series, and commas are perfectly appropriate (see The Oxford Comma–Superhero of Punctuation). She went to sleep, had terrible nightmares, and got up in the morning. This is correct. Three verb phrases makes a series, and it needs commas. He killed her, laughed maniacally, and stashed the body in the woods. Correct again–for the same reasons. 4. Don’t put a comma between two nouns or noun phrases, whether they’re in the subject or predicate. Again, this follows the principle of two items does not a series make. A simple and to link them is enough. Lucy in the sky with diamonds, and the fool on the hill, announced they were getting married today. Both commas are wrong. You don’t need a comma after diamonds to separate only two in a series, and the comma after hill is wrong because is separates the subject of the sentence from the verb. Should be: Lucy in the sky with diamonds and the fool on the hill announced they were getting married today. Frodo was exhausted from the long journey, and from the terrible burden of the Ring. You see this one a lot. People put a comma in because it seems like there should be a pause. I used to do it. But a desired pause is not a good enough reason to use a comma. The second phrase is not an independent clause. 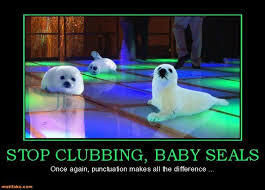 There’s no reason to use a comma, other than you want a pause. If you must have a pause here, force one with an em dash: Frodo was exhausted from the long journey–and from the terrible weight of the Ring. Purdue gave another good example: Jeff told me the job was still available, and that the manager wanted to interview me. The comma is wrong, even though it seems like it should be there. Force a pause another way or rephrase. We’re not allowed to add random commas because we like them. 5. Don’t put a comma after the main clause when a dependent (subordinate) clause follows it–except for cases of contrast. Purdue uses extreme contrast here, but that can make you crazy trying to figure out what’s extreme and what’s not. I usually look for the word although or though; these words exist to contrast. And a dependent clause is simply one that isn’t independent–it has a subject and a verb, but it’s not a complete sentence by itself. She nattered on about how her husband didn’t appreciate her, while I tried to work. While is not a FANBOYS mneumonic, so the two independent clause rule doesn’t apply, and there is no real contrast. You could fix it by saying: She nattered on about how her husband didn’t appreciate her, even though I was trying to work. 6. Phrases or clauses which are essential, not parenthetical, do not get set off with commas. (See Commas and Parenthetical Statements.) That clauses after nouns are always essential. Do not set them off with commas. Who phrases and clauses are tricky. You have to decide if you can take it out of the sentence or not. If you can, then it’s not essential, and it gets a comma. The bananas that the grocery worker dropped are now all bruised. This sentence should not have a comma anywhere. She wished that the dishes would just do themselves. That new book that you loaned me is excellent. 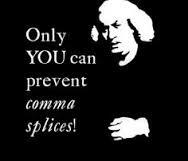 Most writers would take the second that out, but in either case no comma is needed. Those students who cheat are harming themselves. However, these sentences can be restructured so they include phrases and/or clauses that are nonessential. If you take them away from the sentence, you haven’t substantially altered the meaning. Set them off with commas fore and aft. Joe, who cheats all the time, is only harming himself. That new book, the one that you loaned me, is excellent. The bananas, which made an unplanned drop to the ground, are now all bruised. She wished that the dishes, which had now built up until they overflowed the sink, would just do themselves. But really helpful post. I need to come back to it. You sure dialogue is no excuse? It’s sometimes the way people speak, innit? Sure, people talk that way. But the correct form of punctuation would still be a semicolon. 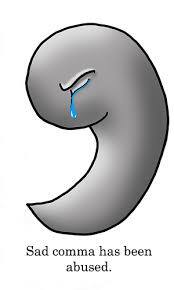 I love semicolons — but you can’t use them in dialogue. 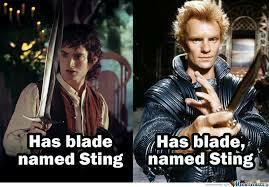 I don’t know why not–they’re far more correct than a comma splice. An em dash, then. Excellent post (very clear — and entertaining, to boot)! I have linked to this in order to help students of mine who are struggling with these issues.